A Gift Card from Rogers Spring Hill Garden Center is always the right choice for any gift! You may purchase a gift card in any denomination that you would like. Our Gift Cards are the perfect gift for anyone on your gift giving list, plus some other occasions you might consider. Do you know someone new to the neighborhood? Want to thank a client or prospective customer? A gift card from Rogers Spring Hill Garden Center would be a great way to let someone special know that you care! At Rogers Spring Hill Garden Center, we appreciate our customers. Our ‘Sunsational Savings Club’ is a way for us to say ‘Thank you’ to you, our loyal customers. Sign up for our Sunsational Savings Club next time you visit the garden center, or click the “Sign Up Now” button below to complete a sign up form! Sign up for our E-Newsletter using the button below! You’ll receive an email newsletter from us about once per week from March through December. 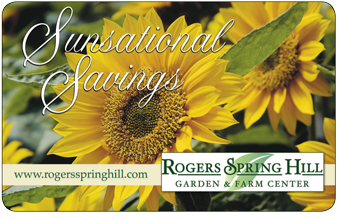 Get great gardening tips, see our latest promotions and sales, and enjoy the latest news from Rogers Spring Hill Garden Center! Click the button below to sign up.